We acquired Luna in April of 2012 as a 20 day old pup. Shortly after her arrival, we noticed that she had some mobility issues. After she suffered an injury from what should have been an non-event for a healthy pup, we discovered that she had a bone density issue that may be related to a vitamin D deficiency. She had surgery to repair her injury at the University of Minnesota Veterinary Hospital at a month of age and started nutritional supplements specially designed for her needs. To this day, she takes daily supplements for this deficiency. Luna is representative of the Great Plains subspecies and is a black color phase, which is believed to be found in less than 5% of the population in Minnesota. 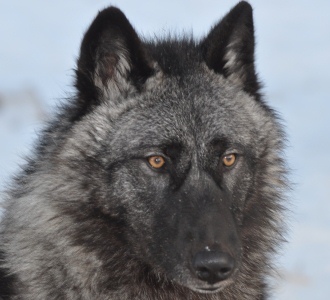 Luna was introduced to the Exhibit Pack in July of 2012 and spent 4 years as the dominant (and only) female in the Exhibit Pack. She had an intensity that was heightened during the weekly carcass feedings, but also when she showed vulnerability within the pack. When the 2016 pups were adopted, we noticed Luna’s intensity increase and were concerned about potential defensive behavior towards the pups. After consultation with the Center’s veterinarian, it was decided to transition Luna out of the Exhibit pack giving time to assess Luna’s physical limitations and determine if there may be underlying issues causing her defensive behavior. 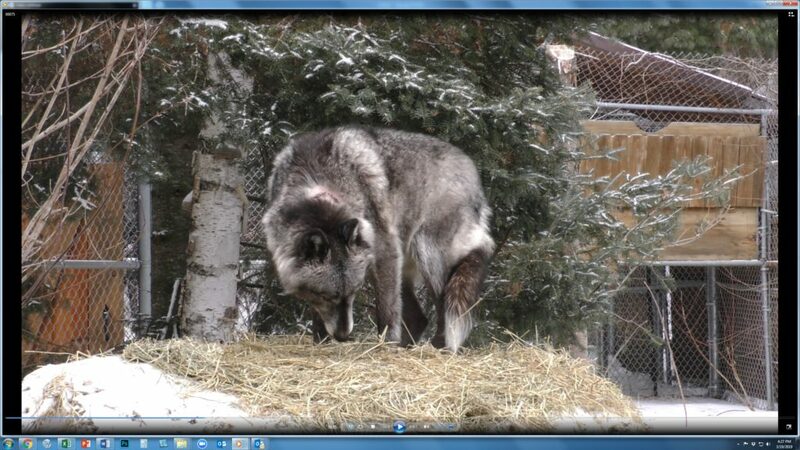 She is currently receiving additional care and feeding protocols in retirement and just recently joined our other retired wolf, Grizzer. They both have access to the 3 enclosures including the “East Side Retirement”, the “Back Habitat” and the “Pack Holding Area”. There is a webcam currently focused on the Pack Holding Area that closest to the wolf yard and the center of activity on site. If you are interested in sponsoring Luna, please click here. Thank you all for the concern and support you have given Luna during this medical situation. Medical issues are always more challenging when there are so many variables to manage. When working with captive wolves, we have the issue of immobilization and transport to the vet clinic, ambient temperatures and the influence on thermal regulatory ability after drugging, keeping a wound clean in an outdoor environment, pack social interactions during recovery and the risk of immune challenges caused by the actual medical issue we are treating. The professionals at the Vet Clinic manage the medical, but it’s the job of the wolf care staff to manage the post-operative care and the social pack dynamics. It’s been our experience that separation from the pack can lead to some posturing and rank issues upon a wolf’s return to the social structure. Fortunately for Luna, Aidan and Grizzer have been very respectful of her and have shown no focus on her sutures. In the posted photo, the suture site is visible on the left side of her neck. While Luna is showing some scratching at the incision site, she appears to be scratching the hair above the site, and not at the suture level. Since a protective cone is not an option, we closely monitor her actions and offer distractions. We have arranged the schedule to have more wolf care staff and volunteers to be in the wolf lab, including full-day coverage last weekend and this upcoming weekend. She also had her nails trimmed at the vet clinic to reduce a toenail catching a stitch. This is a long process of healing; It is standard protocol for dissolvable sutures to be used, eliminating a second immobilization to remove sutures. We expect the sutures to completely dissolve in 3-5 weeks. The results of the biopsy came back today and we are happy to report that it is not a malignant tumor. Unfortunately, they don’t know for sure what it is and are doing more test on it to see if they can figure it out. There are two possibilities, one is that it was an abscess that had gone bad despite the antibiotics, the second is that it may have been from a hematoma. Since it was on her scruff, maybe she was bitten (scruff biting is very common, especially this time of the year and with food possession issues) but the bite wasn’t enough to break the skin and it bled under the skin. If it opened from scratching, bacteria may have gotten in there and grew from there. The suture site remains very clean and shows no redness. She completes her antibiotics today, one week post-surgery. Luna also has a long history of Vitamin D, Ionized calcium issues and her last blood work in 2018 showed some higher than normal Lymes titers which indicated that she may have been exposed to Lymes disease. All of these tests require some time, but I hope to be able to share some results during her birthday webinar. The true test of Luna’s recovery is her willingness to take her morning breakfast and her social interactions with Aidan. We captured some footage of her playbowing to Aidan on the surveillance cameras on Sunday and again tonight and have invited some long-time friends to come and visit (thanks Don). If you want to get a live view of Luna’s activity, follow this link to register for Luna’s Birthday Webinar on March 25th at 5 pm. “Situational Awareness”… these two words describe the most important skill in wolf care (well, maybe second behind social interaction), but having the ability to acknowledge the normal circumstances of wolf interactions and assess when something is not quite right. Wolf care is done 365 days a year; there is always someone caring for the ambassador wolves and every wolf receives a complete visual if not hands-on interaction during wolf care. This is the summary of what we have experienced with Luna in the last few weeks. Staff had noticed that she wasn’t as willing to allow body work which had been such a critical part of her routine. She was displaying a lot of antagonistic behavior towards Aidan during a time when we typically see a bit of pair bonding from these two “former Exhibit Pack leaders”. The most notable observation was that Luna was not interested in her morning breakfast. If you have spent anytime near Luna, you would know that food possession is her favorite past time. This “situation” started in late February. On February 24th, staff documented a spot of blood that could have been the result of a scuffle over a cache or a favorite resting spot (Luna likes a bed in the sun, but so does Aidan). On any physical abnormality, our USDA Vet Care Plan calls for a consult with our local veterinarian and depending on the circumstance, a course of antibiotics is often prescribed rather than risk anesthesia for a veterinary visit, especially in winter months. On the 24th, we started a 14-day treatment of antibiotics and staff continued to try to physically assess the status. 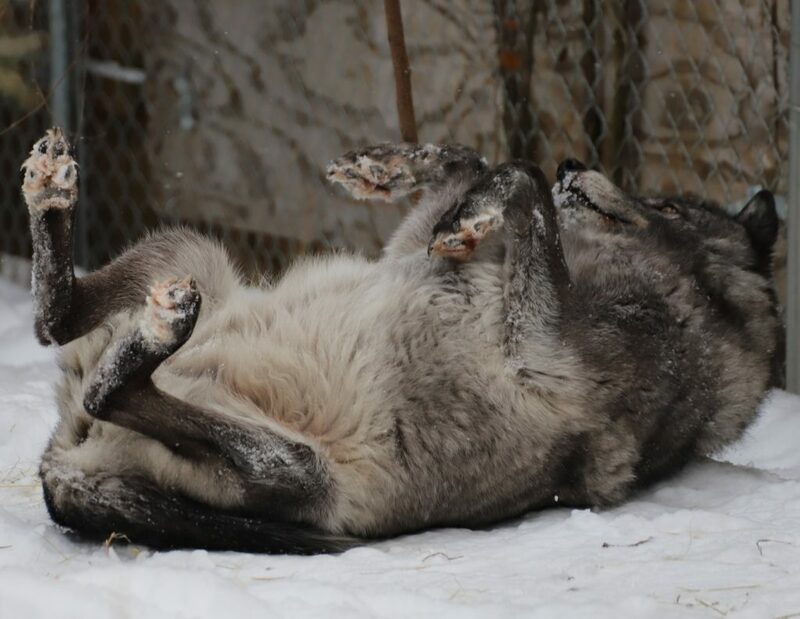 Issues were complicated by Luna scratching the area and causing more irritation as well as sub-zero temperatures that increased immobilization and recovery risks (always a risk assessment in any action with captive wolves). But, it was apparent that we saw limited improvement from the antibiotics and we needed to have a complete veterinary exam. On the morning of March 12th, staff assembled at 7 am for the immobilization; Staff discovered what appeared to be a mass on her neck that had ruptured overnight. She was immediately taken to our longtime vet for a 90-minute surgery to remove the mass and provide adequate stitches to aid in healing for a wolf that would not be wearing a protective cone when she returned to her retired packmates. By noon, she was back at the Center and slowly returning to her old form. She slept in the Wolf Care Center with the wolf curator, and by 3 am, she even showed some signs of food possession, which should surprise none of you! Luna will have wolf care volunteers staying in the wolf lab to listen and implement “Situational Awareness” through the weekend. Luna’s expressions give a good indication of her overall attitude. Here she is displaying a “Roll on Back” behavior. This is definitely a “I feel good” attitude. She has been having a good winter. With the generous donation of cover hay from Connie and Nick LaFond, we are able to provide deep layers of cover hay between each snowfall. This is very comforting for Luna and definitely improves her attitude. After Aidan’s return from surgery, she did have a few moments of posturing, but Aidan took it in stride and Luna gave him his space. Staff did note a very low throat-ed loan howl from Luna while Aidan was resting in a nearby bed of hay. It was certainly out of character for Luna who usually has high pitched rally howls, but even a short separation of a social pack mate can have an impact. Since Aidan’s retirement, Luna has definitely been returning to her own form of social bonding, otherwise known as “Obnoxious Submission”. We need to credit our colleagues at Wolf Park in Battleground, Indiana, for introducing this term through their Ethogram publication. We credit Luna for animating this behavior. In this photo, you will see her display a foreleg stab to Aidan’s face, often followed by several lunges towards him before rolling over to submit. 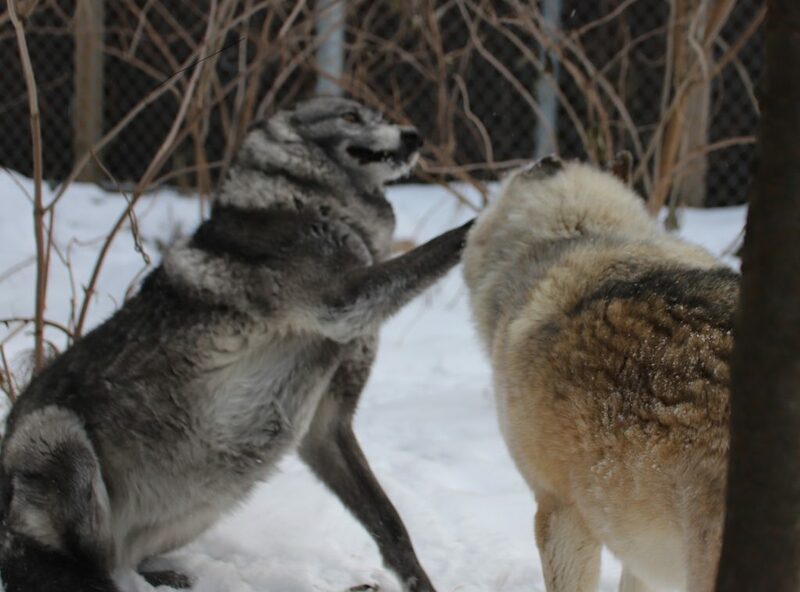 Aidan takes it in stride, since this is the pair-bonding method Luna chose to display when they shared leadership in the Exhibit Pack from 2012 – 2016. Having these two wolves reunited in retirement has increased both of their activity levels, making them more mobile as winter arrives. As we posted in Luna’s last log, she is fed in her own area and receives bodywork daily from staff. To make this happen smoothly, we need a lot of staff trained in procedures and staff have to be consistent so Luna knows what to expect. Wolves tend to be “neo-phobic”, displaying a fear of new things and this can even equate to new or different procedures. One of the most important components of the training is helping people develop the skills to identify body posture, facial expressions and circumstances that indicates a wolf’s attitude, energy and behavioral interactions. 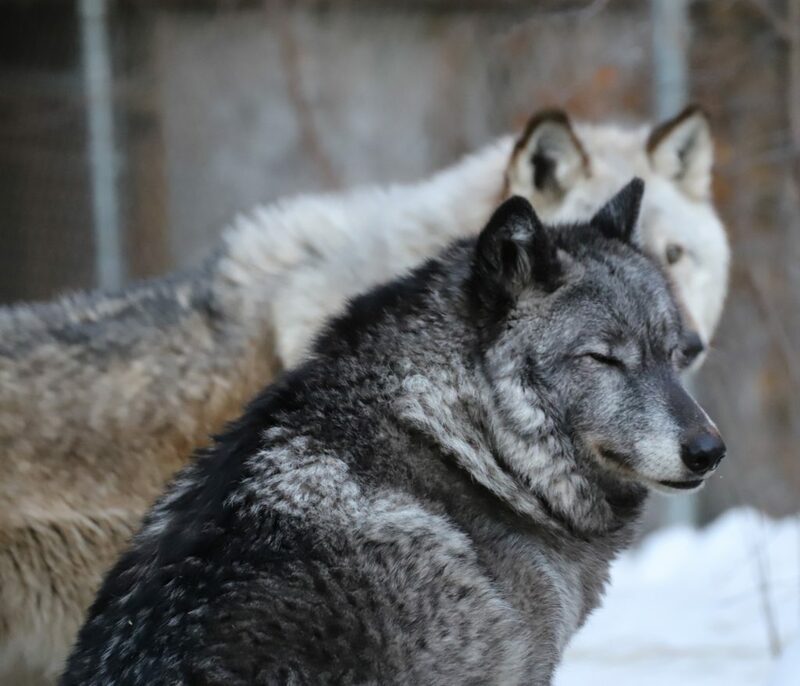 Wolves can be influenced by many internal pack issues as well as external environmental issues such as weather and activities around the enclosure. Luna has started to increase behaviors as winter approaches and she is a great teacher for the staff to learn to interpret and anticipate behaviors. Her most common activity is trying to get Aidan to chase her. She gets a certain look on her face, her ears go sideways, she drops to the ground with her front leg and springs into action. 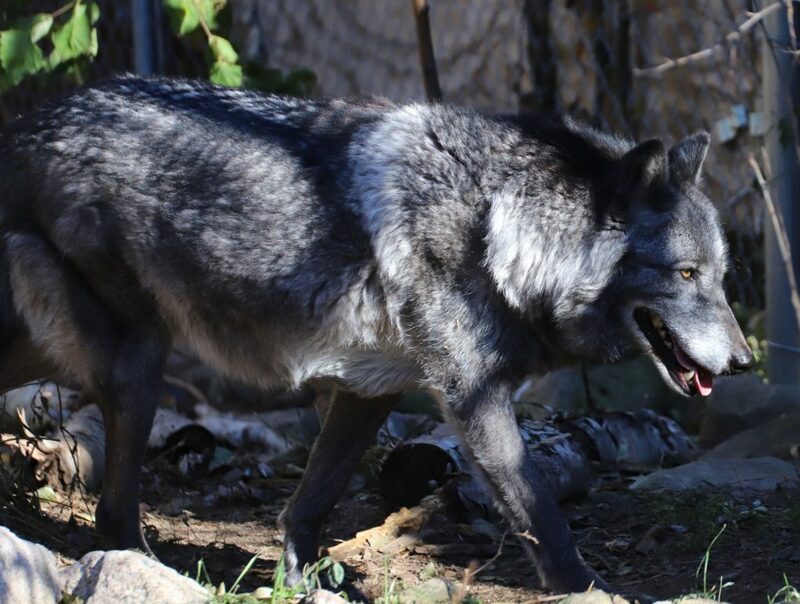 A trained wolf care staff member needs to recognize the first signs of this behavior to make sure they are not in the way of the end result, which is usually three retired wolves doing a loop throughout the three enclosures.